I put together an animation that includes the seismicity from 1/1/2000 until 6/1/2015 for the region near the Blanco fracture zone, with earthquake magnitudes greater than or equal to M = 5.0. The map here shows all these epicenters, with the moment tensors for earthquakes of M = 6 or more (plus the two largest earthquakes from today’s swarm). This is the search that I used for the earthquakes plotted in the map and animations below. Here is the page that I posted regarding the beginning of this swarm. 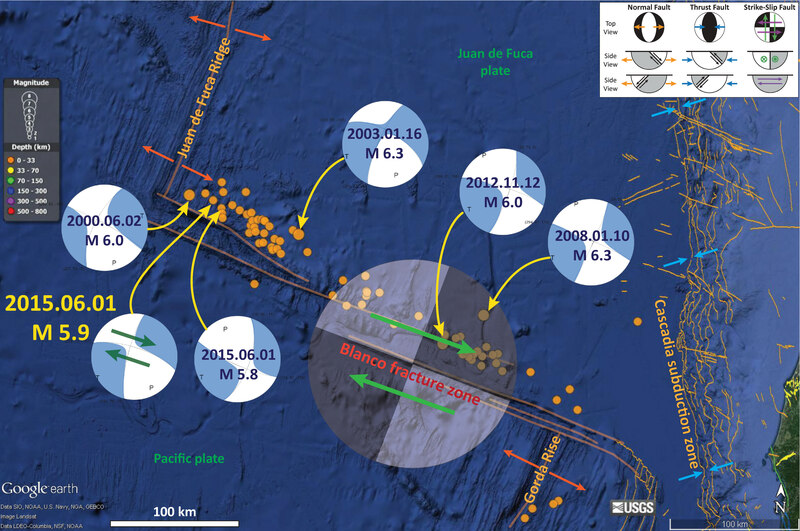 Here is a post from some earthquakes last year along the BFZ. Earthquake epicenters are plotted with the depth designated by color and the magnitude depicted by the size of the circle. 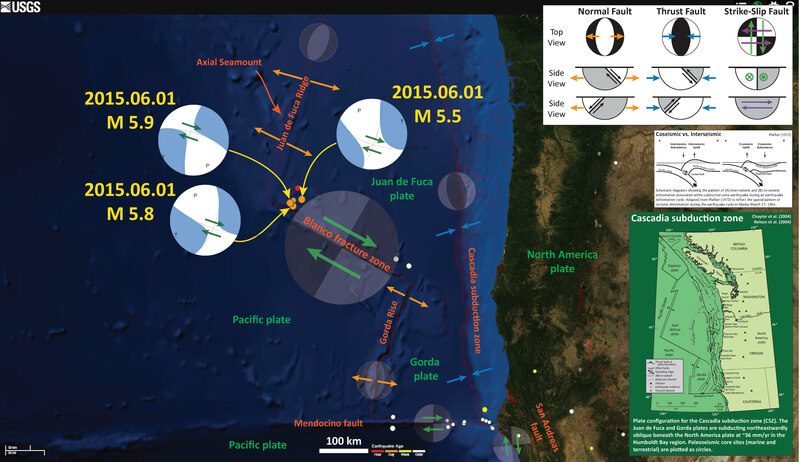 These are all fairly shallow earthquakes at depths suitable for oceanic lithosphere. Here are some files that are outputs from that USGS search above. Here are links to the video files (it might be easier to download them and view them remotely as the files are large). Here is the first animation that first adds the epicenters through time (beginning with the oldest earthquakes), then removes them through time (beginning with the oldest earthquakes). Here is the second animation that uses a one-year moving window. This way, one year after an earthquake is plotted, it is removed from the plot. This animation is good to see the spatiotemporal variation of seismicity along the BFZ. Here is a map with all the fore- and after-shocks plotted to date. 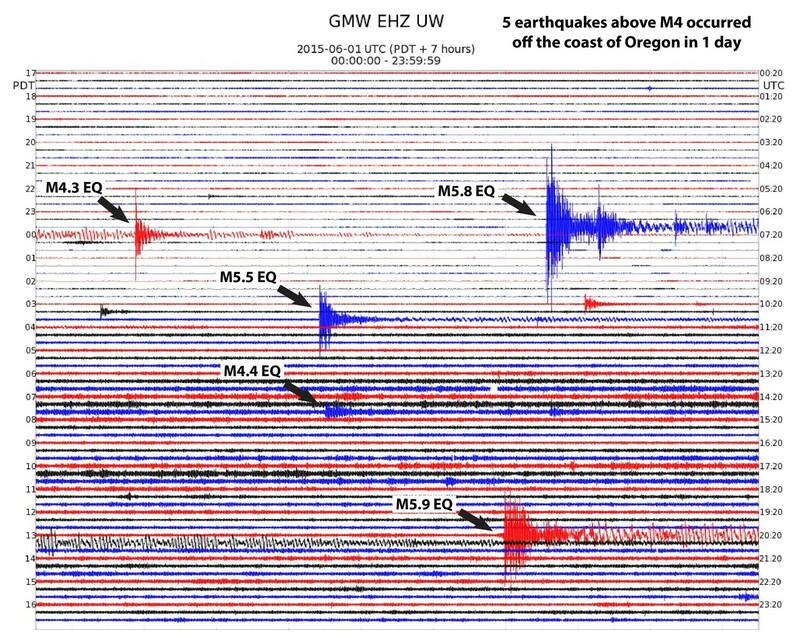 Here is a seismogram from Gold Mountain Washington. Thanks for posting this Pacific Northwest Seismic Network fb page. Here is the page that it came from. Brilliant work you are doing here! Sharing this valuable information with my colleagues. Thank you very much for your efforts, they are greatly appreciated! Thanks for those animations, Jay. That fault is more active than most people realize.